I had to share this photo. 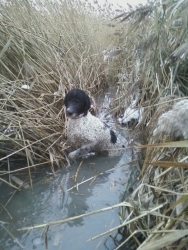 I took Clover duck hunting with me. She loved it and did much better than expected. Guess I got me a new hunting buddy. We lost our english bull unexpectantly in June and went on a mission to find another "child". We found 2. 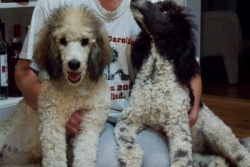 We did this after every standard poodle owner said they wish they had gotten 2 at the beginning. So we got Shelby and Loretta. Cant believe how incredibly easy it was to drive through the atlanta airport curb service and see heads sticking up outside of the bag. we made the 4 hour trip home with no problems. They went in and out of the pet door and now these sweet little pups are 6 months old and have become the sneakiest sock snacthers I have ever had to monitor. They are not loud, so you really have to pay attention and not leave clean laundry out or they will show up outside with a sock and a kiss. We love them and spend much time watching "Poodle TV". They dont know that they are beautiful so they do not have princess fever. However, when you are in bed with them, they will claim your spot and pillow if you allow them. Thank you for working with us and filling our home with with lots of pitter patter poodle feet, and so many smiles for us and all who are blessed to witness. Oh and by the way, we have had NO health issues or problems of any kind. We fully reccomend these breeders/makers of smiles. 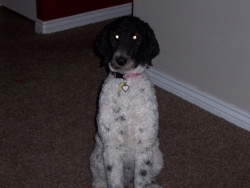 We got our Standard Parti Poodle from them in early 2010. We have been very pleased and are happy with how smart our dog has become. Thanks for everything! We adopted our baby girl from them the end of June 2010. They were very responsible breeders who welcomed us into their home to visit her as she grew up. They got her first set of shots and vet check, and were full of valuable information about the breed. Their home was always clean, puppies well kept, even groomed! They started them on the right track for potty training, as well as socializing them with small childen. Ally has been a wonder addition to our family and we love her dearly and are very grateful they were responsible breeders who cared and loved their puppies.